As a dozen OBceans looked on, a City committee on April 30 unanimously authorized the next step for the Ocean Beach Community Plan Update, allowing it to proceed to the Planning Commission later in May and then the full City Council itself in early July. 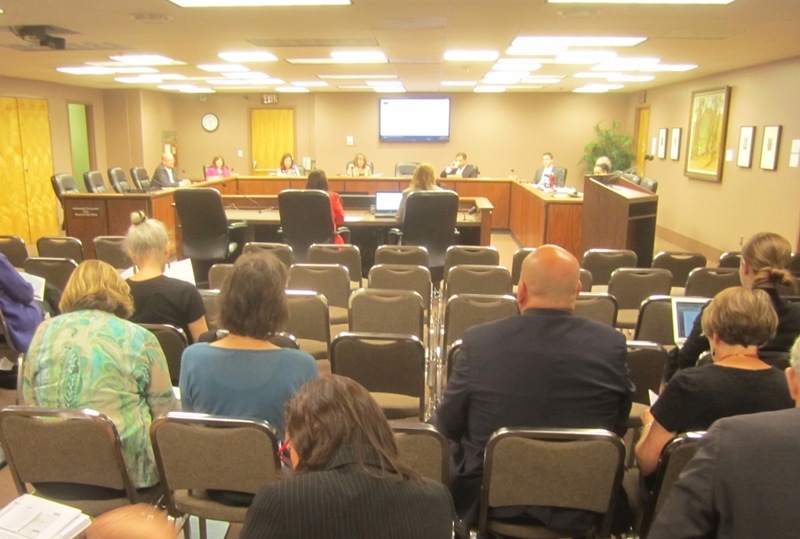 The City committee, the Smart Growth and Land Use Committee, chaired by Lorie Zapf, was the first step in a process for the Community Plan Update that eventually ends when it goes before the California Coastal Commission sometime later this year. Present representing OB and the planners were Jane and Tom Gawronski – Tom is the immediate past chair of the Planning Board, John Ambert – current Vice-chair, Andrew Waltz – a Board member, plus members of the Update sub-committee which included Mindy Pellesier, George Murphy, and Gio Ingolia, plus the group included Gretchen Newsom, president of the OB Town Council. 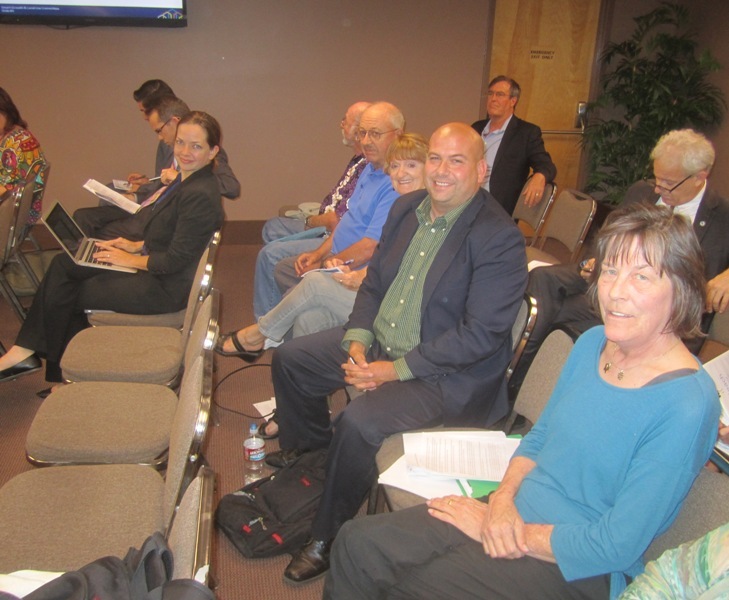 City Council members on the committee included Zapf – the chair, Scott Sherman, Shari Lightner and Myrtle Cole. OBceans turn out to support Community Plan. From left to right of the two rows, John Ambert – barely visible, Andrew Waltz, Gretchen Newsom, next row: George Murphy, Tom Gawronski, Jane Gawronski, Gio Ingolia, and Mindy Pellesier. When the OB Plan came before the committee, San Diego’s planning director Bill Fulton introduced it and immediately turned the presentation over to veteran city planner Teresa Millette – who has shepherded the update process working with the sub-committee, literally, for years. Millette stated that the new plan was part of the integration process of having community plans consistent with the city’s general plan, part of the City of Villages framework. “OB is a real village,” she said, and the plan preserves and enhances the village aspects. In fact, she said, OB inspired the whole City of Villages idea. The new plan protects the residential and commercial areas of OB, Millette said. It improves the visual quality by protecting view corridors and access to the coast. No increase in density is proposed, she continued, however, the plan calls for a rezone of a few properties mainly in south OB to improve the consistencies between land use and zoning. OB has 72 cottages, she said, that have been designated as historical – to date. On another issue, “There are still park deficiencies,” she added, in OB. Millette went on to describe how one area of concern of the planners that she has worked with, regards the granting of variances in some areas of OB, that authorized a greater FAR (floor-area-ratio) than allowed by the current plan. The committee than opened the floor for public comment. The first 2 speakers, although saying they support the new plan in general, were opposed to the language in the plan about variances. Two gentlemen, Mr. Cox and Mr. Steppens, both spoke against the language in the new plan – both own new, large single-family residences on West Pt Loma Blvd that were granted variances by the City which were opposed by the planning board. David Steppens, in particular, stretched the truth when he stated repeatedly that “everybody loves my house,” that no one in the community outside “3 or 4 people” had complained about the granting of variances for his massive home. In fact, his home along with 2 others, have been the source of wide-spread controversy ever since the city granted the variances and the Planning Board opposed them, even appealing rulings to the Planning Commission. “We don’t want to look like Mission Beach,” she declared to nods from the audience. She added that the new homes on West Pt Loma actually took out housing stock. Tom pointed out to the committee the home owners on West Pt Loma who were granted variances “could have built a conforming structure” without them. This writer also got up and spoke – outlining some of the history of the origins of the OB plan, ensuring that the committee knew that the OB Planning Board was the very first democratically-elected planning committee in San Diego and the State of California. “There were workshops, meetings, town hall meetings, more workshops, emails,” it was stated, displaying the years and input from the community that the new plan represents. The “G” word was then uttered – “gentrification” and what it meant. Also it was pointed out that according to San Diego’s municipal code, variances are defined and are in fact very rare. Sherman made a motion to send the Plan to the Planning Commission and City Council, seconded by Lighter. They then voted 4 to 0 to allow it to proceed, without voting to recommend it yet. Next up, the Plan Update goes before the City’s Historic Resource Board on May 22, then the Planning Commission on May 29th, and then tentatively to the full City Council on July 1. It will be very important – crucial even – for OBceans to turn out for the Planning Commission hearing and the Council hearing later this year. Props to Mindy for sticking with this process for so long and for all her work! I remember attending some early community plan update meetings at the Dog Wash, many moons ago. There really has been a wide range of input gathered by this committee. If David Stebbins spent more time in OB and less time holed up in his compound he might realize how many people disapprove of his development. I personally know at least a dozen people who think its a monstrosity, and I’m not even in the ‘village’ of OB anymore. What a loser for choosing this time to speak after over a decade of input went into this plan update. Looking good OB people — in your suits :)!! Did Zapf say anything controversial at this meeting?? Cause I know she’s got a lot of local people concerned about her statements re development.